Checking Account Verification Services mitigate check acceptance risks at the point of sale, with verification options ranging from automated routing number check and negative database options, to near real-time inquiries into current checking account status. Most checking account verification services utilize routing account number validation, which identifies the bank the check is drawn against. These databases can be checked in real time. Negative databases are also often utilized. Based on positive and negative history of that checking account info, a report is generated regarding the account status. 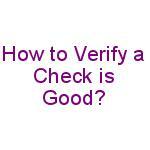 If the check is good or bad, a retailer can report that check status to the database. Many retailers contribute data to the network, so there are many millions of checking accounts to reference. Check verification solutions allow a merchant to validate the account is open and in good standing before the account will be loaded into a recurring billing engine. So a data entry or possibly closed account or even fraud can be caught before “booking” the sale. Friction occurs when a new customer’s payment fails due to bad checking account data, which is a quick way to lose customers. Businesses that rely on future billing are especially vulnerable to bad check data. By knowing how to verify a check is good, businesses can use checking account verification tools to ensure no customers are lost because of data entry errors.